The MegaPods: Open plan accommodation with double bed and pull-out bed sofa, kitchenette and en-suite shower room. Bring everything with you as though you were going camping. 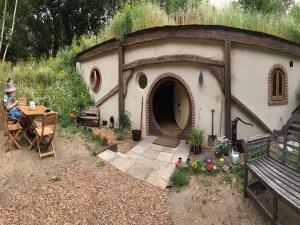 Pod Hollow: 2 bedroomed subterranean-dwelling (Halfling House) with kitchen/diner, sitting room and shower room. All bedding and towels included. Lovely setting amongst the trees. Welcoming on arrival. Good suggestions from their pdf file. Hi Samuel, Many thanks for taking the time to write this review.